Community Update 12 - Bitcoin Private Payment Platform launch. While all of crypto markets seem to be hibernating like bears in the deep of winter our developers have been highly active coding away to bring businesses a crypto payment solution that can conceal their financial information from competition. In today’s community update we would like to share some of the exciting merchant solution developments, and features set to launch with the Bitcoin Private Payment platform on July 31st! We also have additional announcements relating to the launch of Bitcoin Private on General Bytes ATMs, and new BTCP exchange pairings. In addition our Public Relations and Marketing Committee, has organized a contest to harness the power of our great community to win KuCoin’s Community Coin competition! As of today, we have over 300 merchants signed up and anxiously waiting for the public release of BTCP Pay on July 31st. Including M3D who is one of the largest 3D printer manufacturers in the USA. Many of these merchants have already been using BTCP Pay during our closed Beta release, and have provided invaluable feedback to lead project developers Dan Farina and Matt Pass, who have in turn used that feedback to develop some of the features we will talk about today. Fiat — BTCP — Fiat conversion on the fly. 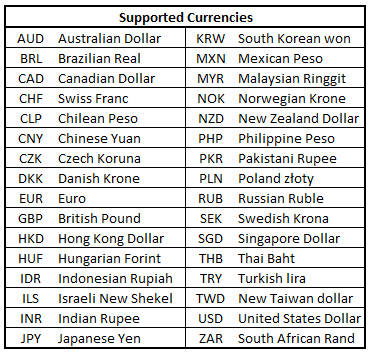 One of the features that have resulted from this feedback is live currency conversion that supports the 32 major Fiat currencies seen in the list below. 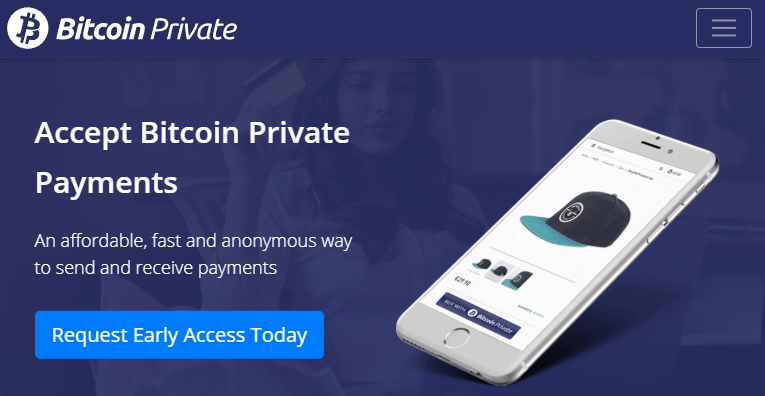 It allows for a merchant to enter the local fiat value of BTCP they wish to receive and BTCP Pay will calculate the amount of Bitcoin Private to charge based on exchange rates that are updated every 5 minutes. Then the customer, who may be in another country, can change it to one of the currencies they are familiar with. In a future release they plan to add Geo IP identification which will default in the local Fiat on both the Merchant and Customer sides. They have also developed working BTCP Pay widgets that can integrate with both WordPress and WooCommerce. Between these two integrations alone, we are opening up BTCP Pay usage to a massive user base who can start taking BTCP payments in just a few clicks. Both of these will be released in July as well. In addition, the team has a development plan in place for Shopify integration that will have a simple setup process and open up BTCP payment usage to an even broader user base. We expect this to be completed in August. Furthermore, they have been working on an Electronic Point of Sales (EPOS) system that will open up BTCP payment usage in stores, restaurants and basically anywhere that is public facing. Below I have included a couple of examples of how it can be used. In a typical store scenario it will allow a merchant to enter payment details, then show customers a payment screen with a QR code. The customer can scan the code to make a payment and the merchant can give the customer a receipt from a POS printer. In a restaurant scenario you can enter the details into a hand held device and when the customer asks for the bill you can print one out from the POS printer and deliver it to their table. The customer can then scan the QR code that is printed on the receipt to make payment. As you can see from the above, Dan, Matt and the rest of the development team involved in the Bitcoin Private Payment Platform project have been making great strides in the effort to push Bitcoin Private’s vision of real world use and merchant adoption. We are all very excited for July 31st when merchants around the globe can accept crypto without revealing their financial information in the blockchain. Join me in thanking Dan, Matt and the rest of the team working on this project in their BTCP Pay discord channel where you can also chat with merchants who are already actively using BTCP Pay. You can access the BTCP Pay discord channel here. 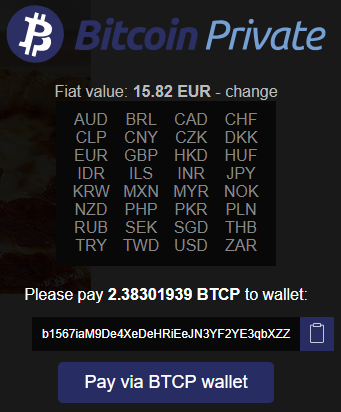 If you would like to start using BTCP Pay earlier you can request access to it at btcppay.com. You can also demo the Bitcoin Private Payment Platform by making a donation through the BTCP Pay button. This is very exciting as it means BTCP is now accessible worldwide without the need for an exchange as seen on their ATM location map below. Our Public Relations and Marketing Committee has organized a contest to harness the great power of our growing community. 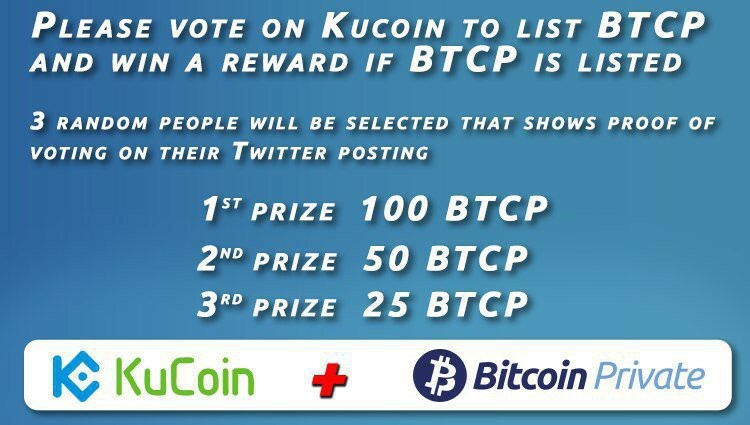 They have created a prize pool that will be given to 3 randomly selected winners who show proof of having voted in a twitter posting if Bitcoin Private wins! KuCoin Voting is open from July 12th to 15th. Please follow the voting instructions for your chance to win! Recently we have opened up our development meetings in discord to the public and have been uploading recordings to YouTube so they are available to anyone who was unable to listen to the live meeting. In case you have not noticed already, HitBTC has opened up market pairing for BTCP with USDT and ETH. If you’d like to get involved with the development of Bitcoin Private, please join us on our GitHub or in our public Discord server. We are excited to continue this community driven, open source journey to bring private transactions, both P2P and commercial, to a mainstream audience.